Buenos Aires ranks high on travel bucket lists: an exciting, European-influenced city in a remote country, renowned for a passionate history and punching above its weight in contributions to global culture. Argentina has given the world the breathtaking music and dance of tango, the legendary Eva Peron (immortalized in the timeless musical Evita! ), some of the New World's best wines from its vineyards, finest beef from its ranches, not to mention its famed polo players, soccer stars, and rabid soccer fans. With a European familiarity, but its own uniquely Argentine and Latin sensibility, Buenos Aires is a world capital where you want to make sure you don't miss a beat. So my colleagues and I decided to try Monograms. It's a hybrid way to travel that cherry picks the best parts of doing it on your own, and combines them with the benefits of groups. Monograms promised all the pleasures of Buenos Aires, with someone else doing the hard work – and a Local Host to provide tips and insights and recommendations. Sounds like the dream way to travel, doesn't it? The Local Host is the hero of any Monograms story. Our guide Analia is a local who loves her city and is passionate about sharing it with guests. Even when she wasn't with us, she was available by phone. It's like visiting a friend in another city: they take you to and from the airport, help you with logistics, provide you with essential insider tips like the coolest restaurants and local tipping practices, take you to some places and recommend other places for you to explore on your own in your free time. Independent travelers are used to that moment in Arrivals. You're tired after that long flight, you haul your bags off the belt, go through Immigration… then you're in Arrivals and you have to rally again to figure out the lay of the land as you longingly file past the signs being held up to greet other new arrivals that promise a warm welcome and assistance. That VIP treatment is yours on a Monograms tour. Our guide Analia was waiting for us, her Monograms sign a welcome beacon in a busy airport. It's not like a large group tour either. No waiting for 30 other people to join us; our group of 3 was whisked off to a waiting mini van. Lugging luggage is the least fun part of any trip. Our bags were taken from us, loaded into the van, and at our hotel, unloaded, and handed to bellmen to take care of from there. A seamless hand-off with no fuss for us. We breezed into our hotel, all without lifting a finger. Or opening a wallet and fumbling with local currency. Tipping had already been taken care of. Monograms tours include hotels, but you still get to customize your Buenos Aires experience. You can choose among different hotels at different price points and different neighborhoods to suit your own budget and interests in the city. Breakfast is included, so you can start your day off right and without having to figure that out. 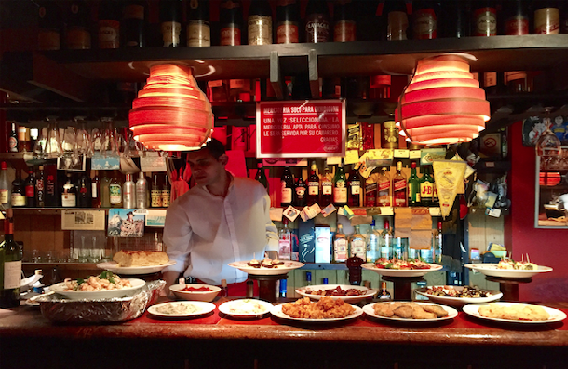 In Buenos Aires, the breakfast buffet was so much more than a generic, 'international' meal. It was hard to resist delicious local dulce de leche (how do you make fresh pastries even better? Adding the local caramel sauce) and some of Argentina's famous meat in the form of thinly sliced cold cuts and sausages. Our guide Analia escorted us in; the hotel staff knew her, and while our bags were being taken from the van to the lobby to our rooms, she smoothly arranged a late check out for us to accommodate our travel schedule. Our hotel was in a busy neighborhood, steps from local shops and cafes and on our first evening, we found the best restaurant around the corner, full of locals and only local dishes and wines – fantastic! What a wonderful way to get the lay of the land. And a private tour of the city with your guide is part of every Monograms tour. Essential Buenos Aires includes the world's widest avenue (which Analia explained to us as we drove in from the airport), the famously and fabulously European architecture, the colorful and eccentric La Boca neighborhood, and even the cemetery in the Recoleta neighborhood, where Eva Peron's final resting place still draws fans and floral tributes. When we were chatting with Analia and she learned of my foodie side, she offered to change the private tour to include the wonderful local market. Although there are 'must see's' in every new city, we were so thrilled our Local Host and the tour was responsive and customizable to our own interests. Some of the customization, like changing up the private city tour to swing by the market, is spontaneous, but other ways to make the Monograms tour your own are baked in so you can put your own mark on your holiday. Your choice of a selection of vetted hotels, your choice of additional, curated experiences that range from a hands-on culinary experience where you learn to make the famous beef empanadas, a tango show, or even exploring outside the city – a cruise on the Tigre river, or a visit to a real Argentine ranch where you can see 'gauchos' in action. Plus, of course, plenty of non-programmed free time so we could do exactly what we wanted. I'd heard about the woman who makes the world's most famous tango shoes, so one free afternoon, we went on our own to the atelier of Comme il Faut for an extravaganza of extravagant, limited edition tango/party shoes. Wow! Even in our short stay, we discovered the best of Buenos aires with Monograms. We loved having a 'back up team' even while we did our own thing, taking the inconveniences of travel off our hands, and providing us the that local contact during our tour and transfers in person, but available by phone throughout our stay who gave us that private, insiders' experience of the 'Paris of Latin America'.